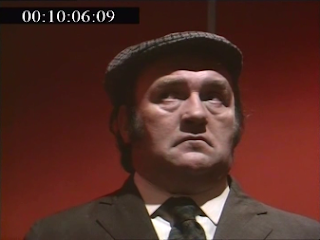 Living halfway up a hill in his "Pennine retreat", Dawson (Les Dawson) lives a solitary existence where two alsations come round once a week to collect the rent. Descending from his hillside residence each morning, Dawson finds himself becoming frustrated in antiquated corner shops where only runner beans are on offer and frequently ends up in Harry's Bar, a downtrodden public house where the jukebox contains, due to a clerical error, a record of Gregorian chants. However, The Loner is much more than trivial frustrations for, at the heart of each narrative, is an exploration of the dubious machinations of humanity and society. The first episode - Dawson's Complaint - finds the righteous, yet vulnerable Dawson rallying against the indignity his fellow man has to suffer at the hands of a corporate giant who is manufacturing pens which will never work. 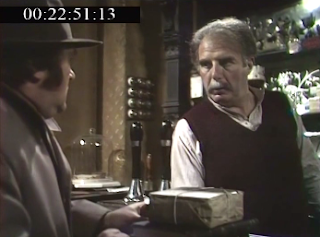 Following this ordeal, Dawson's Connection - the second episode - sees Dawson lumbered with a mysterious package after swapping lines of metaphysical poetry by Andrew Marvell with a stranger in a pub. The final episode in The Loner trilogy - Dawson's Encounter - focuses on a much more personal trial for Dawson as he embarks on a romantic tryst with an enigmatic woman he finds sitting on his hat. 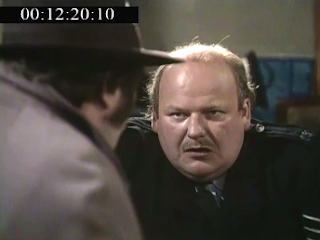 Peter Willes, the head of drama over at Yorkshire Television, was keen to work with Dawson and hatched a plan to team him up with writer Alan Plater who had previously written for Z-Cars and its associated Softly, Softly spin-offs. The initial idea for The Loner came from Dawson - as Plater recalled later on - but the finished product was a collaborative piece. The final series was three episodes long with the 25 minute adventures being transmitted on Wednesday evenings at 9.30pm on ITV in May 1975. The external scenes for The Loner were mostly filmed in the Yorkshire area with both Copley and Sowerby Bridge making appearances, but there was also some brief footage of Dawson filmed near St Paul's Cathedral for the Dawson's Complaint episode. Despite Plater and Dawson being keen to work together again they never returned to the Pennines, there were discussions about a stage adaption of The Loner - to be performed at The Crucible, Sheffield - but this never materialised, mostly due to the intense demands of Dawson's schedule. 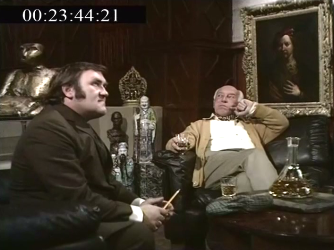 With his world weary demeanour and knack for delivering a one liner with effortless comic timing, Les Dawson was an inimitable character and one who, quite rightly, is woven into the hilarious fabric of British culture. Naturally, anything with Dawson in is of interest, but The Loner was a new one on me. Airing several years before I was even conceived, there had been no repeats and only the first episode has ever been commercially released, so stumbling across some illicit copies of all of The Loner was a welcome discovery. 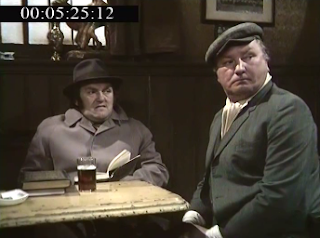 Now, despite being produced by Yorkshire Television's drama department, The Loner is clearly a comedy. Yet it's a comedy which is difficult to categorise; sure, we're treated to one liners in the time honoured Dawson tradition, but there's also the surreal and absurdist narratives which contain barbed satires on society. And Plater's brilliantly innovative scripts conjure up melancholic plots which reflect Dawson's lugubrious demeanour. 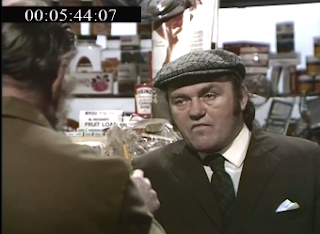 The most ambitious of the three plays, Dawson's Complaint starts with Dawson attempting to register a vague and indirect complaint to a runner bean obsessed shopkeeper (George Malpas); the culmination of this complaint is that the one shilling pen Dawson has recently purchased doesn't work. It's a trifling complaint in isolation, but Plater is keen to use it as a springboard to attack capitalism. The result finds Dawson travelling to London to confront the manufacturers of the pen, Whirlwind Office Supplies Brighouse Limited - they're based in London rather than Brighouse for tax purposes, no one's sure how this works though. However, whilst registering his complaint with a distracted Mr Harding (Brian Wilde), Whirlwind Office Supplies are sold to Global and Brotherhood Insurance of St Ives - they're based in the north of Scotland rather than St Ives for tax purposes, no one's sure how this works. Finally arriving in Scotland to meet with Lord Ross and Cromarty (Cyril Luckham), Dawson discovers that he's unable to strike a blow for righteousness as capitalism is completely out of control. Cromarty casually informs Dawson that there's no way they can stop the assembly line for the faulty pens, it's simply not possible as assembly lines are like wild stallions. It's all very O Lucky Man, but at a heavily reduced - and more easy to digest - length. However, there's one final sucker punch waiting for Dawson. Cromarty counters Dawson's threats to cause an uprising by pointing out that any sort of rebellion would cause his life insurance - registered with Global and Brotherhood Insurance of St Ives - as void. Defeated, Dawson heads back home where he finds he can no longer buy runner beans. And its these sucker punches which define The Loner as Plater twists Dawson's innocent character into dismal situation after dismal situation. Dawson's Connection, which is the most comedic episode by far, once again lands Dawson into a bewildering situation. Dawson - who wrote poetry in real life - is seemingly cursed to carry around a mysterious package after he recites poetry to a stranger in a "Monty Burton suit" in Harry's Bar. The local police station - helmed by Sergeant Hardaker (Roy Kinnear) - refuse to take it in as their lost property room is overflowing with bicycles, whilst Dawson's attempts to casually 'lose' the package finds it constantly being handed back or flung to him. Eventually, after a bemusing encounter with the Citizens Advice Bureau, Dawson discovers it contains forged five pound notes and manages to get it back to Big Sam of the Bradford mafia. Paid off with hush money, Dawson appears to have won and decides to celebrate with a glass of Scotch (on the rocks) in Harry's Bar, but the landlord (Reginald Marsh) refuses to indulge Dawson with ice and tells him "You'll have it lukewarm, like everyone else". However, just as Dawson goes to pay for his lukewarm Scotch, he discovers that he's been paid off in forged fivers. After all, the Queen never wore a cloth cap, did she? And, when Dawson arrives home, there's a further boot to the knackers as he's forgotten to renew his library books. 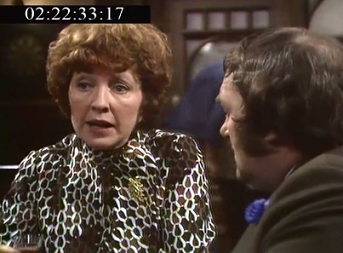 The final episode - Dawson's Encounter - appears to be guiding Dawson towards almost certain happiness as he embarks on a romance with a nameless woman (Gillian Raine) he meets in a restaurant after she takes his seat and sits on his hat. They agree to meet again and, so strongly smitten is Dawson, he tells her that he's willing to accept lies or truths from her - she reveals that she may or may not be married and she has a desire to trample barefoot on potato crisps. However, it's a relationship which isn't suited to reality and the woman eventually leaves Dawson - alone in Harry's Bar - to continue his existence as the archetypal loner. The Loner, clearly, is a kaleidoscopic view of the world we live in and the existences we try to eke out against the tyranny of life's hardships. The sad, pensive air pervades the series much like the mournful inflections of Dawson's stage persona. And it's wonderfully acted by Dawson, a man who looks like he was born shrugging his shoulders, but one who I had previously, due to my ignorance, merely labelled as a fantastic comic/entertainer rather than an actor. He may have worked upon more popular shows such as Sez Lez and Blankety Blank which are still, to this day, venerated and consumed with a healthy side order of nostalgia, but perhaps the finest portrayal of his talents as a comic and a man lie within The Loner. No doubt, it could easily be dismissed as highfalutin, but it only takes a quick scrape of The Loner's complex sheath to see that it delivers a message of clarity on some of the most important aspects of life. And, okay, Dawson rarely has a happy outcome, but is that really any different to anyone else trying to get along in this harsh, unwelcoming world? Readers may be interested to know that the first play, 'Dawson's Complaint' is available on DVD on the Network 'Alan Plater at ITV' collection. Ah, I didn't realise that. Cheers for the info, I'll update the article later! Being from Manchester as Les was,I always thought he was at his best in stand-up format rather than in sketches,as he sometimes appeared a little uncomfortable in character mode,although most of the time,he was amusing and often more than that,especially in his "Cissie and Ada" sketches with Roy Barraclough,and as the sad pervert Cosmo Smallpiece,spectacularly non-PC of course,and such a character would never see the light on TV in this day and age,yet thanks to keeping such vignettes very brief (often barely a minute),Dawson amazingly succeeded in making such an unsavoury individual like this pitiable and even occasionally lovable. I can vaguely remember "The Loner" from the 70's;it was more of a melancholic drama with humorous touches that seemed to suit Dawson's lugubrious,pessimistic persona rather well,showing he was both a decent straight and comedy actor if the right script came along. Alan Plater was a very fine TV scriptwriter,one of the best of his kind for decades,and the series has been unjustly forgotten,maybe because Les' forays into acting have always been overshadowed by his stand-up and sketch shows,along with his stint on Blankety Blank.Many comedians before and after Dawson have struggled when they attempt a half-hour sitcom format and narrative features for the cinema.If memory serves right,this short three episode series was fairly well received,but was not expanded on as viewers preferred to see Dawson in a stand-up/short sketch mode rather than narrative format. At the time of writing,not even short extracts of this series have turned up on YouTube;it would be intriguing to see a somewhat sparse but welcome foray into comedy drama by the much loved Les Dawson four decades after its original broadcast.